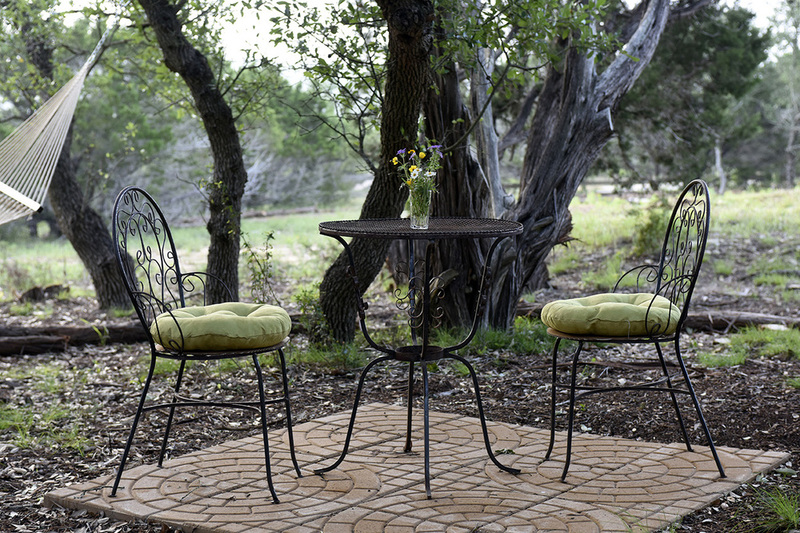 We are pleased to welcome you to Villa Vigneto Texas, located in the beautiful Hill Country region of Texas. Villa Vigneto Texas is an intimate and beautifully crafted Bed and Breakfast and Vacation Rental with stone floors, custom wood trim, and a walking trail that surrounds three private, terraced acres. It is a luxurious and charming home as well as a peaceful space for gathering with friends or a romantic getaway to regenerate, refresh, or just relax in a hammock under the shade of large oaks. As you enter Villa Vigneto, the warm glow of the home and its European ambiance is immediately apparent. Or, you can drop your bags and head to the oak grove to enjoy the view of Sunset Canyon. Inside the home three French doors open to a beautiful courtyard with vine-covered trellises allowing guests to enjoy their breakfast alfresco. At night, the Trellis Courtyard is softly lit for a dinner party with friends or a small gathering to celebrate a special occasion. Villa Vigneto Texas has 4 lovely guestrooms with 2.5 baths and can sleep up to 8 guests when enjoying the full home. Or, you can enjoy our Luxury Bed and Breakfast Experience as the rooms transition into two private suites for 4, each with its own luxurious bath. Information on rates and availability for the Luxury Bed and Breakfast Experience or Full Home rental can be found by clicking the Check Availability button. The grand and elegant style of this suite brings the city of Rome to mind, as its black, red, and tan Turkish rug imbues the room with a classic, European feel. The full 300 square foot suite has a lovely view of the Trellis Courtyard. The beautiful vines and flowers in the Courtyard attract a plethora of hummingbirds and butterflies during the spring and summer seasons. A four poster King bed with a "Sleep Number" mattress, beautifully decorated with a matelassé coverlet, custom shams and upholstering. Antique chairs and a small table should you prefer to have your breakfast "en suite". A coffee pot with a basket of local coffee and flavorful teas. Gilchrist & Soames luxury amenities, a London-based purveyor or fine soaps, shampoos, and body lotion. HDTV with access to Cable, Netflix, Pandora and other online apps. Charging cables for both Samsung and Apple products. Villa Vigneto Texas engraved robes to enjoy during your stay. The European-style bathroom includes a soaking tub and a bidet, surrounded by marble counter tops and soft cream travertine stone walls. A separate travertine shower is also available. The custom etched glass window within Roma's bath is stunning in the morning light and enjoyed best while relaxing in the claw-footed tub. Named after the beautiful city of Florence and its ancient neighboring city Fiesole, these two bedrooms share a full bath and enjoy the view of the large oak grove and walking trail. They can also transition into a full 300 square foot suite for the Luxury Bed & Breakfast Experience for two as the double doors between them are opened and the second bedroom becomes a small living area with an antique table and chairs. The suite enjoys a private bath and a separate pantry/coffee bar. A full bath with marble counter tops and a frameless travertine stone shower. A separate tea and coffee bar with local coffees and flavorful teas. Artistic and colorful Turkish rugs and custom upholstering. The Venezia Guest Room, located off the architecturally-designed foyer, has a beautiful Italian mood. It has dark green textured walls and a hand crafted decorative border tastefully trimmed in dark gold. Aptly named after the city of Venice, its red and rust colored rug and warm lighting makes this room a secluded favorite. It is available only as part of a the Full Home rental. 8 people maximum and a minimum two-night stay required. Full payment due at time of booking as well as the completion of a Rental Agreement. Enjoy The Roma Suite or The Firenze & Fiesole Suite for a special weekend away. Includes a delicious continental breakfast and nightly firepit treats. 2 persons only per suite. Full payment due at time of booking. Villa Vigneto Texas is the perfect place for that small, special gathering - A Special Birthday, the Rehearsal Dinner, The Wedding Day Breakfast. We can accommodate 25-30 people maximum and will handle all the details to make it very special. Call for Service Agreement and Pricing. Reservations cancelled at least 60 days prior to the date of stay receive a 100% refund. Reservations cancelled at least 30 days before start of stay receive 50% refund. Pets and Children under 12 cannot be accommodated at this time. Please note, there is no smoking allowed in the home and only in limited places on the property due to the risk of fire in this area of the country. Please check our availability below. If the date you are looking for is booked, please give us a call and we will put you on the wait list should there be a cancellation for that particular date. Be sure to include any details you would like to include to make your stay memorable - from a chilled bottle of wine upon your arrival, to a stocked pantry, to flowers in your room. Options are listed below and pricing will be provided. A continental breakfast can be delivered at a time selected by the house guests, no waking up early so you don't miss breakfast! Villa Vigneto will add some staples to your pantry so you don't have to go grocery shopping on your vacation! You create the list, we shop, we stock. A bottle of the Hill Country's finest wines can be chilled and waiting for you or tell us which rooms you would like to add a fresh bouquet of flowers for a special "Welcome" with a handwritten note. Set up Venezia as your personal exercise space complete with treadmill or as use as a yoga studio for any guests staying at least 5 days. A Yoga Instructor is also available for private lessons. Enjoy a relaxing 1.0 or 1.5 hour massage from the Villa Vigneto Texas House Masseuse, an expert in the use of essential oils to lessen your stress and enhance your overall experience here at the Villa. The softly lit lights under the Oak Grove at night make for a spectacularly romantic evening or special celebration. Add live music to make it unforgettable. Have fun with a cooking class for your group and enjoy the fruits of your labor served in the Trellis Courtyard or "Under the Oaks". When you’ve just arrived and weary from your travels, your “First Night Pasta” can be waiting for you to include a bottle of Italian wine, homemade marinara sauce, pasta and fresh garlic bread. Coming to the Hill Country for an Anniversary, Birthday Weekend or Engagement? Let Villa Vigneto suggest some ways to make it special. Too busy to plan what to do and see before you arrived? Let the Villa Vigneto hostess make some suggestions. Ask us to send you the "Highlights of the Hill Country Survey" of your preferences and we'll come back with ideas and a day by day plan! Villa Vigneto Texas is located approximately 30 minutes southwest of downtown Austin and only minutes from the center of Dripping Springs, also known as the "Wedding Capital of Texas". 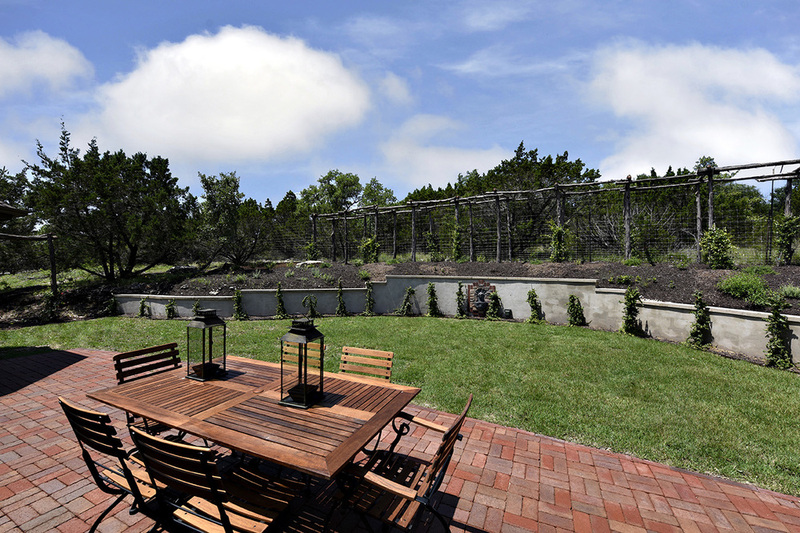 Villa Vigneto Texas is the perfect home base for exploring the Hill Country region of Central Texas .......come and enjoy, we'd love to show you around! Please note that Google Maps does not accurately photograph this location and look for the driveway on Upland Drive. Villa Vigneto Texas is only open for reserved guests and available for tours during our Open House events periodically scheduled and posted on this site.